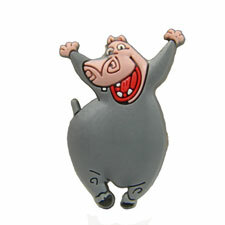 Everyone's favorite hippo, Gloria from the movie Madagascar, strikes an exuberant pose with arms outstretched and mouth grinning wide. Don't you just want to wear her on your shoe? Well, you can, if you own a pair of Crocs or other holey shoes. She's a darling shoe charm, perfect for gift-giving.